1 Stan Dorn, Julia Isaacs, Sarah Minton, Erika Huber, Paul Johnson, Matthew Buettgens, and Laura Wheaton. “Overlapping Eligibility and Enrollment: Human Services and Health Programs Under the Affordable Care Act.” Washington, DC: Prepared by the Urban Institute for the Assistant Secretary for Planning and Evaluation, DHHS, December 2013. 3 Section 1413(c)(3)(A) of the ACA requires that “to the maximum extent practicable” Medicaid and other health programs must “establish, verify, and update eligibility” based on data matches. See also Centers for Medicaid and CHIP Services (CMCS). April 19, 2012. Medicaid and CHIP in 2014: A Seamless Path to Affordable Coverage: Application, Verification and Renewals. http://www.medicaid.gov/State-Resource-Center/Downloads/4-19-12-Applicat... (Medicaid and CHIP in 2014). Legislation signed by the President following the ACA’s enactment required that: (a) before tax credits and cost-sharing reductions for marketplace coverage were made available, the HHS Secretary was obliged to certify to Congress that eligibility for such subsidies was being verified; (b) by January 1, 2014, the Secretary was required to submit a report to Congress that detailed how eligibility for those subsidies was being verified; and (c) by July 1, 2014, the HHS Office of Inspector 21 General must submit a report to Congress describing the effectiveness of “procedures and safeguards… for preventing the submission of inaccurate or fraudulent information by applicants” for marketplace coverage. Section 1001 of the Continuing Appropriations Act of 2014, H.R. 2775, First Session, 113th Congress, http://www.gpo.gov/fdsys/pkg/BILLS-113hr2775enr/pdf/BILLS-113hr2775enr.pdf. 6 See, e.g., Appendix A to 2 CFR Part 225, C3. 7 Martha Heberlein, Tricia Brooks, Joan Alker. Samantha Artiga and Jessica Stephens. Getting into Gear for 2014:Findings from a 50-State Survey of Eligibility, Enrollment, Renewal, and Cost-Sharing Policies in Medicaid and CHIP, 2012–2013, Georgetown Center for Children and Families and Kaiser Commission on Medicaid and the Uninsured, January 2013, http://kaiserfamilyfoundation.files.wordpress.com/2013/05/8401.pdf. 8 FNS. “SNAP State Options Report: Ninth Edition,” November 2010. 9 Rick Friedman, consultant to APHSA, formerly CMS, personal communication, 2014. 11 Mann, Concannon, et al., 2011. 13 Charles E. (Chuck) Lehman, Division of State Systems, Center for Medicaid & CHIP Services, Centers for Medicare & Medicaid Services. Health Care Reform Impacts and Opportunities: A-87 Exception. 2012. http://nwi.aphsa.org/docs/Slides_Eligibility_Modernization.pdf. 14 Enhanced funding requirements involve seven conditions and standards: 1) a Modularity Standard; 2) a MITA Condition, which involves the overall information architecture of the Medicaid program; 3) an Industry Standards Condition; 4) a Leverage Condition, which requires leveraging federal funding to maximum effect; 5) a Business Results Condition; 6) a Reporting Condition; and 7) an Interoperability Condition. CMS. Enhanced Funding Requirements: Seven Conditions and Standards. “Medicaid IT Supplement” (MITS-11-01-v1.0). April 2011. http://www.medicaid.gov/Medicaid-CHIP-Program-Information/By-Topics/Data.... 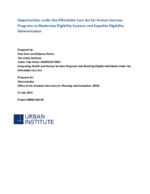 It is only the jointly purchased or developed service that must comply with these conditions, rather than the underlying human services eligibility system itself, which greatly increases the feasibility of this approach. 15 Mann, Concannon, et al. 2012, op cit. 17 See Rick Friedman. “Technology guidance for horizontal integration of health and human services.” APHSA National Workgroup on Integration, May 2012. http://www.aphsa.org/content/APHSA/en/pathways/NWI.html. 18 CMS. “Facilitating Medicaid and CHIP Enrollment and Renewal in 2014,” SHO #13-003, ACA #26, May 17, 2013. http://www.medicaid.gov/Federal-Policy-Guidance/downloads/SHO-13-003.pdf. 19 All estimates in this section of the paper are from Dorn, Isaacs, et al. 20 The nominal eligibility limit is 133 percent FPL. However, 5 FPL percentage points are subtracted from gross income in determining net income. Accordingly, the gross income eligibility limit for newly eligible Medicaid adults is 138 percent FPL. All Medicaid children must likewise be covered with gross incomes up to at least 138 percent FPL; but because of maintenance of effort requirements, children in many states have income-eligibility thresholds above that level. 22 45 CFR 155.260 (a). 23 See 77 Federal Register 18444, Mar. 27, 2012, as amended at 77 Federal Register 31515, May 29, 2012. 24 Internal Revenue Code (26 USC) §6103(l)(21)(C). 26 See §1137(a)(5) and (6). 28 A typology of such data-use strategies is set out as an Analytic Framework in Appendix I to Dorn, Isaacs, et al., op cit. This list of examples is borrowed from that appendix.